The Abbey of Gethsemani recognized Br. Aaron’s 25 years of vowed life in the community on March 25. 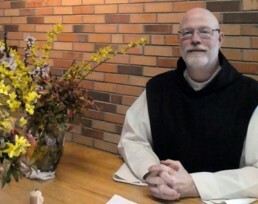 After the standard six-month postulancy and two-year novitiate, Br. Aaron took his first simple vows on the Feast of the Annunciation in 1994. He renewed those vows 25 years later during Mass in the presence of his fellow monks. Br. Aaron is currently Gethsemani’s cellarer, which involves overseeing all the monastery’s work operations. He is also the Master of Ceremonies for the liturgy and fulfills innumerable other duties. But above all, he is a good and faithful brother. Please join us in giving thanks for Br. Aaron’s faithful service and perseverance. Br. Aaron on the 25th anniversary of his vows.